AXA and XL deal: where’s the benefit? The recent announcement that insurance giant AXA is to purchase XL Group for a reported $15.3bn is sure to have some within the insurance industry on high alert. Where will AXA – Europe’s second largest insurer in terms of market capitalization – see the most growth from the deal? GlobalData Financial Services analyses the deal. In today’s uncertain economic climate, diversification is fundamental to businesses not only surviving but thriving. The two companies complement each other well in a number of categories. In the UK, AXA’s commercial property and liability lines are expected to grow considerably once the purchase is complete, enabling AXA to diversify its business quickly in search of greater opportunities for further growth. In 2016 AXA’s UK GWP stood at £3.45bn, while XL’s UK GWP was far smaller at £330m. This suggests that, despite the scale of the deal globally, the impact on the UK insurance market is unlikely to be highly disruptive. 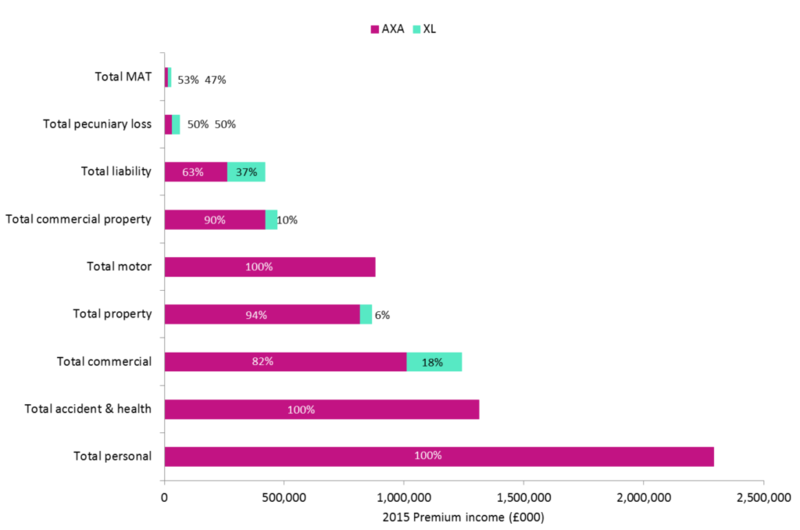 The below graph indicates the potential areas for growth within AXA’s UK business following the acquisition of XL, using 2015 premium income data. It is evident that AXA’s presence in the UK commercial insurance market is one of the business lines that will see the most growth. However, despite the apparent potential benefits of the deal for AXA on the global stage, analysts have been skeptical, with some stating that the valuation of XL seems high. The true benefit will no doubt emerge over the coming years once XL becomes fully integrated into the AXA brand. One thing is for sure: AXA will instantly have a stronger presence in markets it once had a lower profile in, making this a clear statement of its ambitions.